The Aruban Youth Telephone Line, Telefon Pa Hubentud, was launched on November 20, 1999, as an independent charity, with its distinctive telephone number’131′ and logo, aimed at children and youngsters from 8-24 years old and provides its service from 14.00 hours to 18.00 hours, 365 days a year. The plans for a telephone line in Aruba had been around for some time, by private organisations as well as within the Policy of the Minister of Social Affairs. In 1999 a small group came together and decided to carry out the project of setting up Telefon Pa Hubentud based on information gathered especially from the youth Helplines of Holland who are in existence for over 20 years and the Curacao Telephone Helpline that was in existence at that time. The main difference between these helplines within the Kingdom of the Netherlands is that Telefon Pa Hubentud commenced with the experiment of including teenagers within its volunteer counselors’ group, an experiment that is resulting in success. Telefon Pa Hubentud is recognized on a national and international platform. We received a start up subsidy from ” Juliana Welzijn Fonds” and ” Kinder en Jeugd Postzegel Fonds” both organizations established in the Netherlands. Telefon pa Hubentud is also member of the Child Helpline International since 2014. Telefon Pa Hubentud has a cooperation protocol signed with the Aruban Ministries of Telecommunication, Education and social Affairs. Since November 2002, children can call “131” free. Besides using the telephone service to contact Telefon pa Hubentud the children and youngsters can also email us or chat with us through our 131 mobile app. – Primary prevention: preventing problems by supporting callers in handling their situation. – Secondary prevention: Recognizing a threatening problem and supporting the caller in helping find a solution. – Tertiary prevention: Preventing that a caller should further experience negative results of a problem. Often this may result in referring to specialized treatment. It is clear that the telephone, email and chats the way is that children could directly ask for help, when no other child protection agency seems approachable to them. Besides telephone, email and chat counseling, Telefon Pa Hubentud also has an ” indicator’s function” with regard to the problem causing factors that lie behind social problems of children and youngsters and to develop and stimulate projects and programs that are aimed at preventing and handling these problems. For this indicator and policy function Telefon Pa Hubentud maintains as target group: Society in its entirety. Telefon Pa Hubentud is a charity organization, the only two persons who receive a salary are the Director, a psycho-social worker. Our foundation is dependent on monies it receives as donation and a small subsidy it receives from the Government. In order to be able to carry out projects that are scheduled, Telefon Pa Hubentud is always looking for sponsorship. Our staff visit schools around Aruba to give presentations about Telefon Pa Hubentud’s work, is invited to hold workshops, lectures and projects on issues like bullying, divorce, sexuality and other topics. The staff gives also workshop to teachers and leaders of child care and other professionals about topics regarding the problems youngsters encounter in their daily life. Telefon Pa Hubentud produces a range of reports, leaflets and fact sheets, posters and general information packs, designed to raise awareness of specific problems and containing advice on how to deal with them. Telefon Pa Hubentud doesn’t just listen to children – we also give them a voice by campaigning on important issues which affect their welfare and rights. On November the 20th, the international day of children’s rights, Telefon Pa Hubentud always presented a new project which is a topic that is selected from the telephone calls, emails and chat conversations we receive from children / youngsters. Our first project was ” Bullying” because so many children talk to us about it, tackling bullying has become a central part of Telefon Pa Hubentud’s work. In an effort to promote anti bullying schemes that really work, a mayor campaign was launched in 2000 to spread good practice in schools. Telefon Pa Hubentud produced instructions booklets for the teachers, pupils and parents, posters, fact sheets and after given several ‘talks’ at schools, most school incorporated this subject in their social classes. In 2014 Telefon Pa Hubentud re-launched an anti-bullying project called Prevencion di Termento na Scol. Divorce, children’s right, communication skills, sexuality, sport code of conduct, online protection and no violence are other topics which Telefon pa Hubentud has present as a project. Our counselors aim to empower the children and youngsters – with information, with choices and with emotional support; to build their confidence and assure them they are not alone. 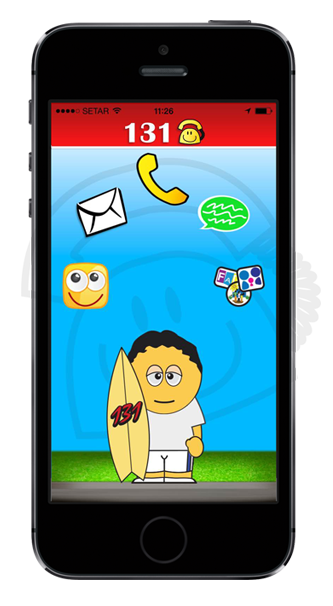 Telefon Pa Hubentud is effective because children and youngsters know that ‘131’ is theirs. Children don’t have to ask an adult permission before they call. There is no waiting list, the telephone gives them privacy and the choice of how long they want to talk. They are in control and we believe this is why so many young people call us every day. Telefon Pa Hubentud’s counselors encourage children to share their problems with an adult they trust. For children living in troubled households, this may not always be a parent – it could be another relative, a teacher, family friend or a neighbor. But often, after talking with one of our counselors, young people realize that their parent want nothing more than to hear their problems and help them sort things out. All telephone calls, emails and chat conversations which are anonymous, are registered. The staff consists of a Director and a Social Worker, they are the ones in charge of doing lectures, workshops, projects and they are also representative of Telefon Pa Hubentud. The Staff is available for contact during the office hours.